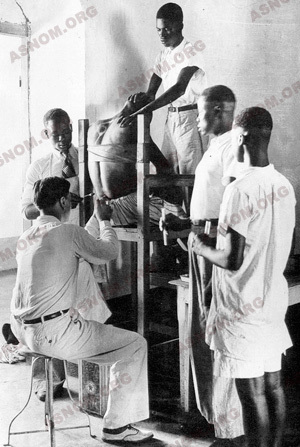 In the tropics the Colonial Medical Corps has had to gradually put in place training facilities for native health-workers as they had an important role in the implementation of health policies. Prior to envisioning the building of medical and pharmaceutical academies, the Colonial Corps strove to train nurses, midwives and other paramedical personnel. 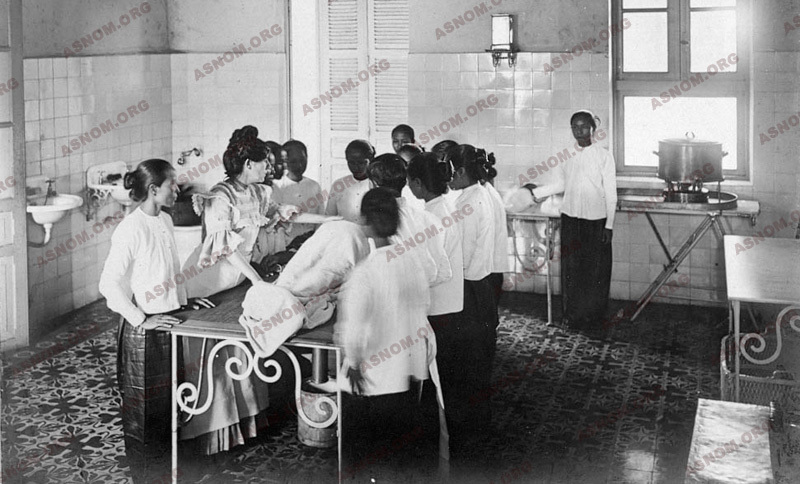 Several dozens of thousand male nurses and nurse's aids, several thousand midwives and midwifery nurses are estimated to have been trained in the French colonial empire. Nurses were very important cogs in the system. They helped physicians and represented them in faraway clinics. Close attention had to be paid to the training of nurses and midwives with two original characteristics, when compared to those of European countries as it aimed at making trainees able to take decisions and to fulfil public health duties. There were also other personnel such as pharmacy, laboratory and radiology technicians who were trained in schools for vocational training or in nurse training schools with specialized curricula. Physicians and Pharmacists were an important constituent of the "human resources" of the Public Health Services but as there were only a few of them they were a small minority in the staff which was mostly composed of nurses. - Physicians, Pharmacists and Dentists : 150. - Nurse aids, cleaning operatives : 900. - Assistants for health maintenance, and technicians : 350. - Management clerks and other operatives : 1 450. Paramedical staff supervisors had been trained or recruited in France. Such as head nurses for hospital departments and operation theatres, radiology technicians and head midwives. 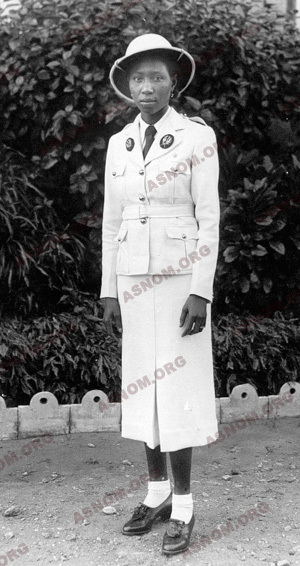 Beside Military NCO nurses, there were also some civilian personnel who had been recruited by the Ministry of Colonies as "colonial midwives or nurses". And there were also some religious orders providing registered nurses who were employed on contract. Otherwise the "auxiliary personnel" or those who belonged to the so called "Local Personnel framework" were all Indo-Chinese, African and Malagasy natives who had been recruited to work for their Colony Public Health Services. Later on, WHO suggested that the appropriate designation of this technical personnel should be "Health Operatives". It should be underscored that budget constraints were the only reason for these small numbers which were not in anyway related to a poor evaluation of the needs or to inappropriate requests of Health authorities. "Nurse" is a designation which encompasses different kinds of personnel according to the period of time which is considered. In the early days of the French overseas, illiterate recruits were only carrying patients on stretchers, making easy dressings, delivering medications and aenemas, and washing patients. To achieve the control of Trypanosomiasis which constituted an endemic scourge in Cameroon Jamot* set up a "Health Assistant Training School" upon his arrival there which supplied trainees with some basic and practical training. 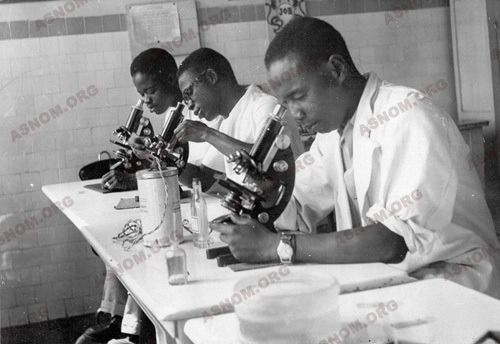 Some of them learnt microscope maintenance, those who had a command of reading and writing were assigned to writing the names of individuals, while others were trained to perform sub-cutaneous injections and so on... The most outstanding success was achieved with the training of "microscopists" who were very bright at tracking trypanosomes on smears. Within a decade, primary schools that had opened led some children as far as the 1rst certificate in primary education. Those who had been selected with competitive examinations were admitted to training institutions for teachers, office clerks or nurses which had been built in the capital of each colony. A faculty of colonial army physicians trained nurse students on the town's hospital premises. Their syllabus had been arranged according to the kinds of in and outpatients they would come across during their training. This made it a very practical one which was supplemented with some theoretical teaching. Altogether this curriculum was two year long. 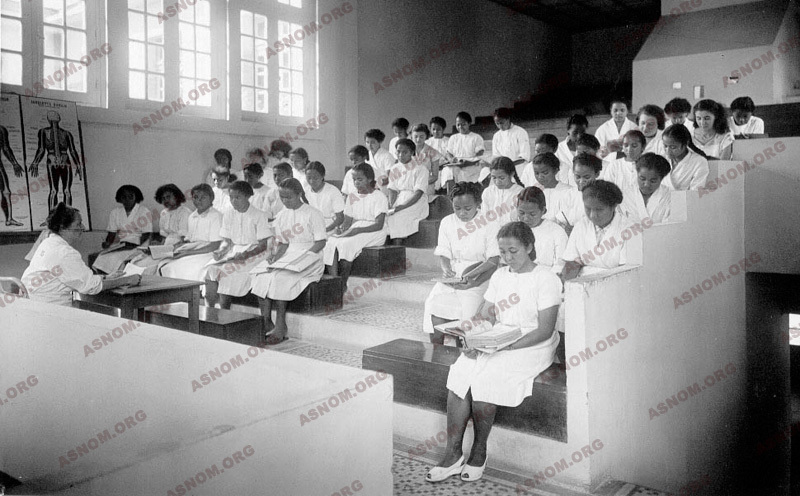 Later in 1951, another nurse training course was started in Dakar for Africa and in Antananarivo for Madagascar with the objective of training nurses who earned upon their graduation the French diploma of "registered nurse" (as most of the other colonies had been granted a new statute in 1946 the diplomas which their students could earn with their training had been set accordingly). Trainees were recruited after passing the exam called "brevet d'etudes du premier cycle" or "BEPC" which takes place half-way in the high school curriculum. The syllabus, the methods of training and the duration of the vocational curriculum were the same as in France. This registered nurse degree was valid for private practice and admission to this training school was not limited to those who intended to hold positions in public health services where they had the statute of civil servants. Many French or Lebanese trainees enrolled for this training in their own right. In 1960 each class of Dakar Nurse Training School included around sixty trainees who were nationals of different countries. Once these countries had won their independence, these two courses were concurrently kept running in some countries. The first one was for "health operative" training and the other one for "nurse training" with its applicants selected just like in France when they had completed the high school curriculum. With an additional training some of them became superior nurses and got positions of trainers in national training institutions. Before the arrival of Europeans, pregnant women had to give birth at home. Still afterwards, over the next decades, deeply entrenched cultural attitudes regarding pregnancy and delivery made that even in large cities traditional midwives continued to be very often called upon. Progressively but very slowly women started to pay calls on maternities or clinics. It became then obvious that the number of fatalities declined sharply but also that the follow up of pregnancies and the monitoring of baby deliveries had to be left to female health workers. Female auxiliary health-workers started to be trained daily on the field of action and later female nurses took over as soon as the nurse profession was no more exclusively left to men. Midwifery training schools were started shortly after the opening of medical academies. In Antananarivo and Hanoi in 1900, in Dakar in 1920 young women who had successfully passed the primary school test started their training after their admission with a competitive examination They received a grant and were boarders. Their curriculum was three year long The diploma which they earned by the time of their graduation entitled them to work in public health facilities only. In 1948, France decided that the only midwife diploma to be acknowledged was the national one and so all local training institutions overseas had to close and midwifery colleges meeting the required French standards took over. From 1920 to 1957 Dakar Midwifery School trained around 450 midwives. When the Midwifery College was started it had to be operated exactly as in France. At first students were recruited after passing the BEPC examination which takes place half-way in the high school curriculum, and then later, their admission took place only after completing the high school curriculum and passing the subsequent exam. The degree which they earned was the French national one which was valid nationwide so that these young French and also Lebanese women could now take advantage of positions which were available in private hospitals beside the ones in public health institutions... Each class had about thirty trainees. After they had won their independence all countries had their own college built and started to issue their own national diploma. At first these training institutions awarded degrees, which entitled those who had earned them to work in public health facilities only; Faculties of the Colonial Medical Corps were fully entitled to establish the curriculum and select the training methods as they saw fit, After thoroughly screening the prevailing working conditions, these painstaking trainers were fully aware of how these future health-workers could fulfil their duties and so they implemented methods of training which they selected to match the needs accordingly. Trainees acquired their skills first while looking at nurse care procedures and also while looking at the way to behave with patients' relatives. Then later they strove to do the same, time and again under close supervision. but only, when a vehicle was available. - The other characteristic had to do with the need for communities to be protected and this was achieved through making trainees aware of public health duties. In some nurse training schools, such as Senegal, trainees had to pick one of the three following training courses : The "Healthcare course" where they learnt procedures to diagnose and treat medical conditions which had been recorded on technical cards, the "Social Nurse" course (social nurses were working closely with midwives in the framework of the "Mother and Infant Protection Plan"), and the "Sanitation training course". Sanitation nurses were concerned with the maintenance of good standards of hygiene in communities. There were also other opportunities for nurses to train in the fields of Major Endemic Diseases Control such as for Trypanosomiasis at the Muraz Center and Leprosy at the Marchoux Center.